Prevent heartworms, fleas and a variety of other parasites with Sentinel Spectrum, a tasty, beef-flavored chewable tablet that provides unparalleled protection for your dog. Sentinel Spectrum provides active protection against roundworms, tapeworms, hookworms and whipworms, as well as heartworms and fleas. 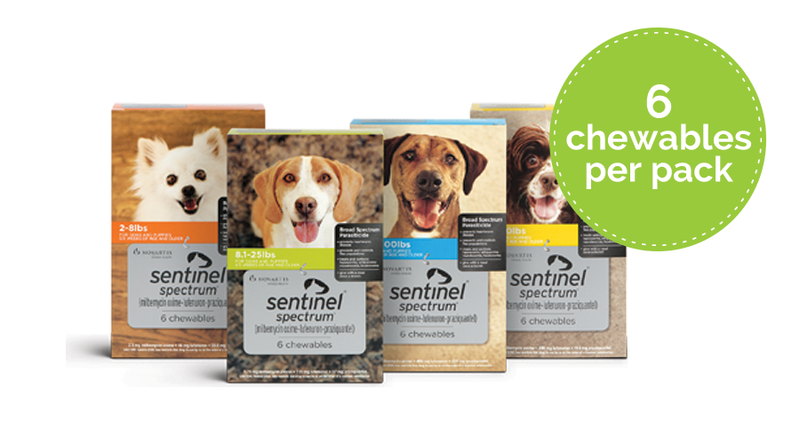 Give Sentinel Spectrum chewables as a treat with or without food. Ensure your dog chews the treat rather than swallows whole — treats may be broken down into smaller pieces to encourage chewing — and consumes the entire dose. Give your dog this medication only as directed by your veterinarian.